A fine map of the region with good detail throughout. 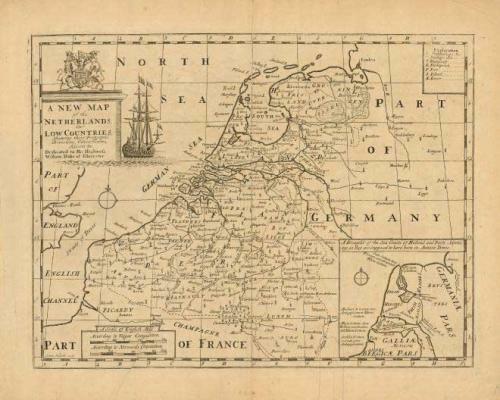 There is an interesting inset of the coast of Holland in ancient times. The map is richly decorated with a large title cartouche featuring a large sailing ship and the coat of arms of the Duke of Gloucester, to whom the map is dedicated. A good impression on hand laid paper with very wide margins. Remnants of hinging tape on back and a couple of printer's creases near the centerfold. Numerous short marginal tears, well away from map image.